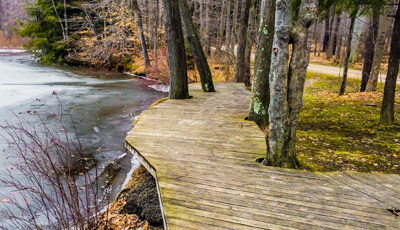 This 926-acre park is leased from the City of Akron in a partnership that allows for conservation of natural areas as well as enjoyment of recreation and outdoor education. Five trails total 4.7 miles. More than two miles of the statewide Buckeye Trail winds along the western shore of East Branch Reservoir. The eastern shore and all islands are designated preserves and only accessible during naturalist-led programs. A secondary entrance is located at 15055 Mayfield Road (Rt. 322). Headwaters Boathouse is a must-see structure and a great place to hold your event. 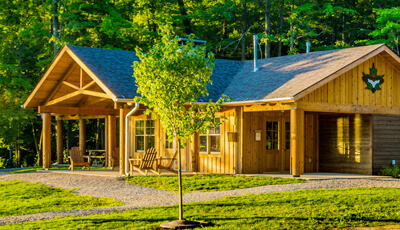 Click here to learn more about, or reserve, a campsite or lean-to. It's not just water! Be sure to spend time hitting some other picturesque trails. 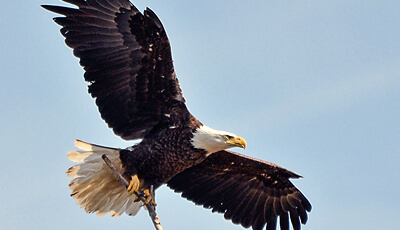 You'll love the beauty of this natural watershed that is home to a multitude of species, including Bald Eagles. At the headwaters of the Cuyahoga River, East Branch Reservoir is the northernmost of the four reservoirs that supply water to the Akron metropolitan area. The City of Akron implements a variety of management practices to maintain a high-quality water supply. These include keeping watershed lands in natural states so that forests, meadows and wetlands can filter out sediment and pollutants before they reach waterways. The natural state of watershed lands also provides quality habitats and recreation opportunities. A beech-maple forest, meadows and evergreen plantations surround these waters. The land is home to wild turkey, fox, mink, owls, hawks and a variety of songbirds. Abundant wildflowers carpet the forest floor each spring. Headwaters Park is also a popular stopover for migratory waterfowl each spring and fall: loons, Tundra Swans and many types of ducks. Bald Eagles and Ospreys often soar over the reservoir; Cormorants sun themselves in the trees on the islands. Sandpipers and plovers visit the reservoir in late summer. 2019 Update: This year’s boat borrowing season opens Sunday, June 2, and concludes Tuesday, September 17. Days open will be Friday through Tuesday 1 to 8 p.m.; each day’s last boat goes out at 7 p.m. Please read the information below before you head out to the park – thank you! Beginning in June and lasting through early September, kayaks and canoes can be borrowed seasonally for self- guided tours of East Branch Reservoir from the Boathouse, first come, first served. Each loan can last up to two hours. Hours are posted during the season; please refer to News & Updates for notice of exceptional hours, and call 440-279-0850 to confirm hours before your visit. Geauga County residents can borrow the park’s limited number of kayaks and canoes for free (ID REQUIRED); out-of-county residents must pay $5 per hour for adults, $3 per hour for kids 12 and under, and $8 for tandem (credit card only, paid onsite). Provided life vests must be worn at all times, and a driver’s license will be held as a security deposit for each loan. Anyone under 18 must be accompanied by an adult.